Stop Hate UK have just launched a brand new 24hr helpline for reporting LGBT hate crimes and incidents across the UK. The service will allow people to report any hate crimes or incidents that they have witnessed or experienced with the choice of remaining anonymous. They will also be able to receive information and advice around LGBT hate crime, immediate emotional support if needed, and referrals to local support such as housing, social care, legal, and local LGBT organisations. So what are classed as Homophobic and Transphobic hate incidents and hate crimes? Homophobic and Transphobic hate incidents relate to anything that you or others believe has been motivated because of someone’s sexuality or gender identity. Anyone could be a victim of homophobic or transphobic hate crime, this could even be if someone simply perceives you to be LGBT, if a friend or someone in your family is LGBT, or even if you have involvement with LGBT organisations. Hate incidents can range from verbal abuse including name calling and offensive jokes, harassment, bullying and intimidation, physical attacks and threats of violence, abusive phone calls and texts, online abuse, graffiti or damage to your property and arson. Once an incident becomes a criminal offense it becomes a hate crime. This could include physical assaults, sexual assaults, theft, criminal damage, and in worst case scenarios murder. Why is it important to report hate incidents and hate crimes? If hate incidents and hate crimes go unreported, no one will know that they have occurred and nothing can be put in place to prevent them from happening again. I know a lot of people –including myself – who have experienced homophobic or transphobic verbal abuse at some point or another and not reported it to the police. For me it was about not thinking it was serious and not wanting to waste police time. I now know that I should have reported it because not only does it pinpoint areas where the abuse is happening, but it could also help to stop other people having to experience the same, or worse, treatment. When it comes to reporting hate crimes there are many barriers for trans people when coming forward to the police. This could be because previous negative experiences, being unsure or fearful of how trans aware the police are, or simply not wanting to ‘out’ themselves. By reporting to Stop Hate UK or other third party reporting agencies, it bypasses these barriers and gives the opportunity to remain anonymous. A report can be made about witnessed or experienced hate incidents which can then be reported on your behalf to the police. This ensures that figures of Transphobic hate crime are recorded which in turn means that provisions will have to be made for tackling Transphobia on both a local and national level. So what can we all do to tackle LGBT hate crime? 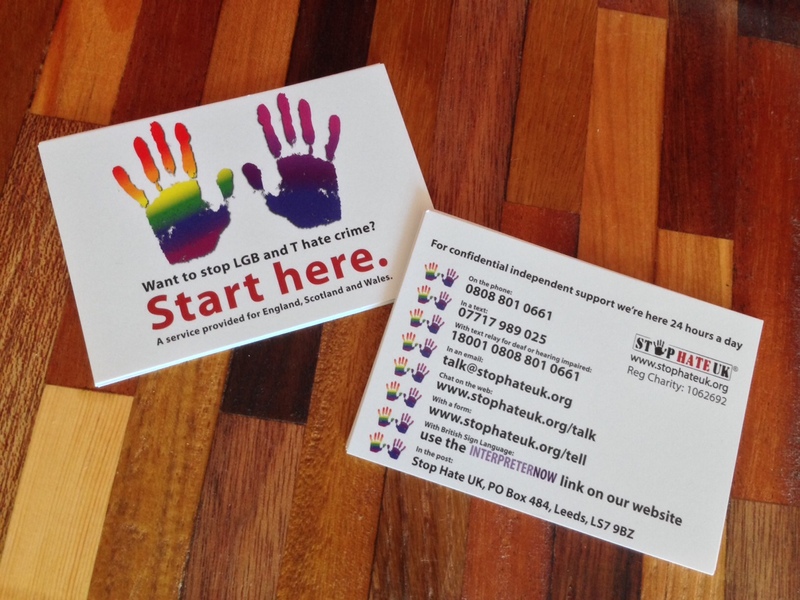 Report it – Take note of the new Stop Hate UK LGBT Helpline number – 0808 801 0661. You can also ring 101 for the police and ask to speak to the SIGMA Unit. If it’s an emergency always call 999. Challenge it – If you hear someone using Homophobic or transphobic language tell them why it’s inappropriate, if it’s someone at home or a friend at school educate them about why it isn’t acceptable. 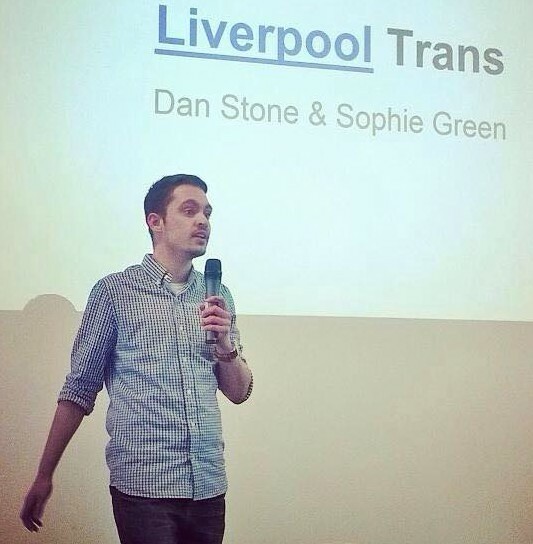 Take Action – It could be something as simple as sharing information about reporting hate crime with friends and family, if you’re in education speak to your teachers/tutors about challenging it or getting DRM in to speak to the class, you could also volunteer with your local LGBT groups and organisations… the list is endless!